In the spring and summer of 2016 I was in touch with four scammers: horse riding lessons scammer Victor Smith, event scammer Michelle Dormanen, art scammer Albert Spencer and wedding scammer Anthony Martinex. I played around with them, made them think I was falling for their scam, then burst their balloon at the bitter end and told them no, I was not going to send them thousands of euros, pounds, dollars or whatever. Please don’t let any scammers know about this web page! The objective here is to make these miscreants waste their time on people like me who haven’t been fooled for a second, distracting them from baiting others who might fall for their scam. On September 15th 2017 I received a message from “Richard Matt”, where he asked me about accommodations and didn’t specify anything about where or of what kind. This inquiry is wildly ridiculous because I’m a photographer and have nothing to do with hotels, real estate or accommodations. 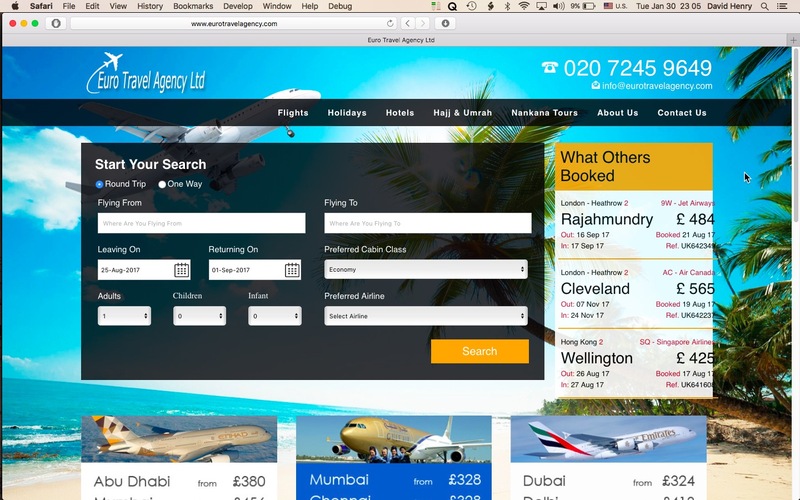 On September 26th 2017 (two weeks before eltravelagency.com was scheduled to expire) someone took out the www.eurotravelagency.com domain name, complete with an SSL security certificate to inspire confidence, and a much more serious page layout, attempting to look like a bona fide travel agent web site. As always, and now more than ever, it’s important take anything you read or hear with a grain of salt. This site is mirrored from www.euroasiatravel.co.uk, a site that can thus be considered equally suspect, as well as all the other links leading out from either web site. On October 5th 2018 I noticed that the eurotravelagency.com domain name is no longer active. The only connection might be that I photograph apartments regularly and Mr. Matt might have found me by searching Google for apartment, Paris, accommodations, or who knows what. He has to be completely boneheaded to think I manage hotels after looking at a page about me following his search on Paris and apartments. 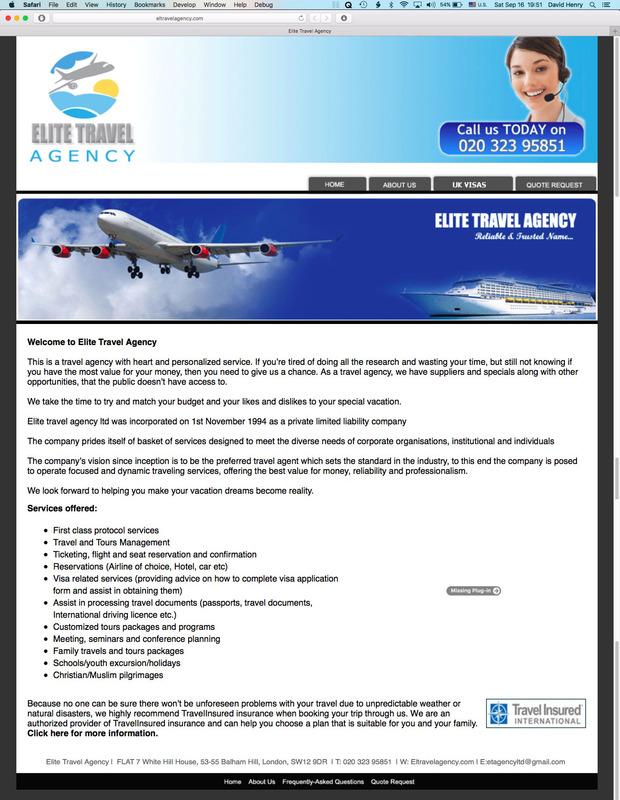 I searched eltravelagency.com on Google and somewhere after the first half-dozen results I found a page in Greek saying the site is run by scammers: “Hotels accept reservations from a distance (via e-mail) in which prolific “agents” ask them to charge cards whose data have been intercepted by the actual owners themselves and then requested the business to assign their commission via Western Union, or by way of remittance in order, as they claim, to send them other reservations. Bookings are mostly made from the following travel agencies: Elite Travel Agency… they request that the commission be sent by wire transfer to a bank account in England (Halifax & Barclays)”. A few more results after that I found two more pages in Greek saying basically the same thing. Checking WhoIs records on the site shows that it was created on October 10th 2016 and will expire on October 10th 2017. I don’t know much about about domain name longevity though I imagine this is further evidence that the site is a fly-by-night affair and has only been created to make Elite Tours Agency appear to be a real and bona fide business. Thank you for writing! Certainly I have rooms available for your group in that last week of October. The rooms in my hotel are luxurious and offer the utmost in comfort with wonderful views over the city of Paris. You may make reservations at 300 euros per night, please don't hesitate to ask further questions, and do keep me posted as your travel plans to Paris take shape! Due to past experience, we want to make full payment now, will that be accepted? We have arranged an agency fee of 45% of total rental fee with our clients as our commission so you need to increase your room rate to accommodate that. Could you please send us another quotation with our commission so we can send it over to our customers? Please let us know if you are still interested in making the reservation for us base on the above stated conditions. I’m very pleased you have chosen us for your accommodation needs in Paris! We can indeed accept payment by bank card through PayPal. There’s no problem with full payment ahead of time, or a 50% downpayment a week before is fine also. Adding your agency fee of 45% to the room rate of 300 euros per night results in a daily fee of 435 euros. For six rooms this amounts to 2,610 euros per night and for eight nights, October 23rd to the 30th, the total is 20,880 euros. I’ll be happy to transfer your commission of 45% on receipt of your payment and I’m reassured by your level of professionalism in that there will be no cancellation once the reservation is confirmed. To be continued…? Towards the end of December 2017 I received an idiotic e-mail from Peter Tetteh, asking me to purchase airplane tickets for him. We too have had the same contact from Richard Matt. I have played along with it this last days. He has now sent us the credit card numbers to be charged.. Have you had any further correspondence?. If I was in the UK I would forward it to the police as his company name is supposedly based in London. But im in SE Asia now working. I figured out it was a scam after trying to call him as I had my suspicions the way he conducted his business. What travel agency works like this. The fool! Do people actually fall for this!? What's your advice? Have you notified police? Thanks for posting your blog. I haven’t heard from Richard Matt for two weeks now, since September 15th 2017. I had three exchanges from him, then… nothing, I don’t know why. It might be that he did a bit more research on me and saw that I’m a photographer, have nothing to do with hotels or providing accommodations in Paris, and was likely playing around with him. It could be that he had someone else “gathering leads” who (obviously) isn’t very competent. He took my info provided by the lead provider, wrote me a few times, then decided to search information about me for himself once I appeared to be falling for his scam, and decided I wasn’t worth pursuing. I doubt that contacting the police would help much, it doesn’t matter much that you or I are not in England because “Richard Matt” probably isn’t either and English police wouldn’t be able to find Mr. Matt, do anything about him or whatever. I imagine that people do indeed fall for scams like Mr. Matt’s, that’s why it’s important that anyone who’s been contacted by him and haven’t been fooled write web pages that others can find by searching Google. I’ve read your article about “Richard Matt” and that helped us to confirm our doubts. He still operates, now under another agency name. You can read below if you are interested. Many thanks for that. I write to substantiate if there are offered rooms for a group of 7 people for 12 nights starting from March 5th to March 17th 2018. We wish 7 single rooms or 4 double rooms. Are you looking for a B&B or a hotel (3 star, 4 star)? Thank you for your web page informing about that kind of fraud! These scammers are still in effect and found us, but thanks to you we understood with whom contacted. Warm greetings from Mongolia. Thank you for warning me not to get scammed, I too had email conversation started with email titled “5pax accommodation”. It was strange but I sent accommodation quotation and and tour details. After few days exchanging emails, we want me to advise about getting payment by only credit card. Then it went strange and I looked on the internet and found your website. Now he (she?) is using the name of Alan J Hicks. I wrote this email to just say thank you for helping me to confirm it was scam. Kindly let us know if you can meet our booking request. The “Elite Travel Agency” is still out there and this time he changed his name to “Alan J. HICKS”. This is sent to my work mail, he did some researches about my accommodation and tried to contact me. I tried to Google this “agency” right away and found your post. Lucky me! And thank you for your post! It helps me throughout this scam. He continued to ask for alternative periods of 2-week-reservation and local tour bookings. After that he did contact me on viber through this number: +447451208550. Will you be able to accommodation 5PAX for period of 14nights? Request date as followed - May 3rd until May 17th, 2018. If yes, two or three rooms are needed base on your available rooms. So therefore, let me know quotation on three rooms if available, if not, please advise me quotation on two rooms. Some 4days tour programs are require during the visit. Let us know what you can offer or you link us with tour agency around. Don't hesitate to write us with complete response to our booking request above. Googling led me to your website, he is still busy, now purporting to be Euro T Agency, note he has a different email address which makes his email less believable. Thanks for the info on the scammers! They are still working and try to contact also us. Do you have rooms available from Nov 15th till Nov 29th, 2018 and it will be for two couple (4adults). Kindly let us know what will be total cost for two rooms for the request date? Let us know if each of your room can sleep two people because two rooms are require. If not, let us know what you have available or what you can offer. Also, reply with room quote in Euro currency. Thank you for your response. Yes, the booking is still relevant. Can you confirm the reservation full quote in Euro? So we could understand what our client will be paying. Be informed that full 100% payment will be made upon booking confirmation by credit card. Please advise if accepted? We noticed that you have been tracking the activity of the below e-mail address in your blog. They are still active. Can you please confirm availability and assist in making the reservation. Thanks You for your page, letting me know that this was an scam, Sorry for my bad English, We are located in Peru, South America, Until here this scam has being active, Good to know that theres good guys over the world. Enviado el: miércoles, 26 de diciembre de 2018 10:24 p.m.
Will you be able to accommodate 4guests on 13nights for the following date - Feb 20th until Mar 6th, 2019? Number of rooms needed will be two and what is your rate per room in Euro currency. We charge only in dollars or Soles, the currency of Peru. You can also book thru our web site and find some discount inn promotion. We keep in touch for any other info. Enviado el: jueves, 27 de diciembre de 2018 08:02 a.m.
Kindly confirm total cost on two deluxe rooms will be €3,068.52? If not, please confirm to us the right cost. Also, 100% payment will be made upon booking confirmation using credit card. Please advise if accepted?